Entering the new year makes for the perfect opportunity to redecorate our homes, because they’re so 2017. Moving into 2018, you want to leave everything in the past and in terms of interior design and see whats trending. Oldrids & Downtown, retailer of quirky dinner sets and a department store that has over 200 years’ experience have given us a few pointers on what to look out for in 2018! In order to predict whats in store for 2018 we need to quickly reflect on 2017 and a quick run through of the trends we have all been loving! The World’s Colour of the Year for 2017 was the world’s brightest neutral – Greenery. Who would have thought this colour was a hit, it was used in commercial and fashion design – making it an instant hit with the likes of me and you. Greenery represents refreshment and revitalization, which a lot of people could relate to during that time. Untreated walls were another hit in 2017, with a rustic and industrial look being more aesthetically pleasing for our social media feeds, yes we have all seen it on our Instagram feed! This was pleasing to the eye especially when it's complimented with a wood burning stove. This trend was a brilliant way for homeowners to save both time and money when decorating, whilst giving them the flexibility to be versatile with their furniture. When it comes to homeware, cork-themed furniture was a fond addition. The environmental friendly material was commonly used throughout the year to make items such as vases, glasses and even lampshades. However, they were often accompanied by a metallic surround that gave off a youthful yet premium vibe. 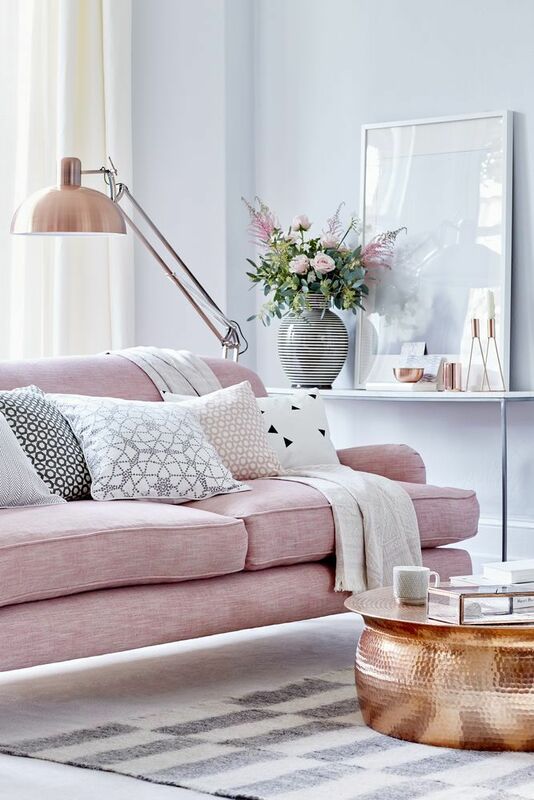 We all seemed to love a touch of metallic in our homes to bring it back to life and yet so on trend. When looking at what was popping in kitchenware, a big trend that captured everyone’s heart was the use of mason jars as cups. What ever the age, everyone had one in their kitchen. This trend even caught on with restaurant owners, who discovered that they could use these to serve drinks as well as storing food and ingredients. Accompanied with a striped straw, mason jars are the perfect item to serve a nice cool beverage. They have also been a hit with weddings using them as decor or favours adding a nice rustic touch. Although copper was big in 2017, it will go out as quickly as it came in. Gold and brass furniture will make its return and will become a household essential, although making it subtle is the key to making them look good. I have to say I fell into this category with the cooper, gold and silver with it working very well in a minimal apartment. Pristine white kitchens were a big thing for last year too, but this year homeowners will find themselves mixing and matching with materials and colours to give their kitchens a bit more character. Everyone seems to have a white kitchen, white tiles and white marble worktops and, frankly, it’s a bit repetitive. Again I fall into this category with the minimal white kitchen and virtually empty surfaces with a few copper items on display! Moving onto threads in your home, whether this is your cushions or your curtains, rich colours are essential. This can really benefit the furniture you have in your room and make it pop to any visitors. Don’t go too wild with different colours, but at the same time don’t be afraid to try something you haven’t used before, such as a mustard tone but sometimes you can't just change one item, I feel you need to change a few things to make sure it all blends in well together. Darker walls are going to be another hit, as 2017 saw us favour those lighter and brighter colours. For those who opted for untreated walls last year, it’s time to leave them there and generate something new in your living space. Picture grey walls with your mustard curtains, yes or no? Withhold the elegance in your home by opting for a palette of aged colours that will make the most beautiful backdrop. With gold coming back, we think that a 70s theme will be popular throughout the home as well and perhaps some wooden furniture. From units in your living room to your dressing table, you will have plenty of storage space that will accompany the colour of your walls and threads beautifully. Those are some of our trends for 2018, any of them interest you at all?